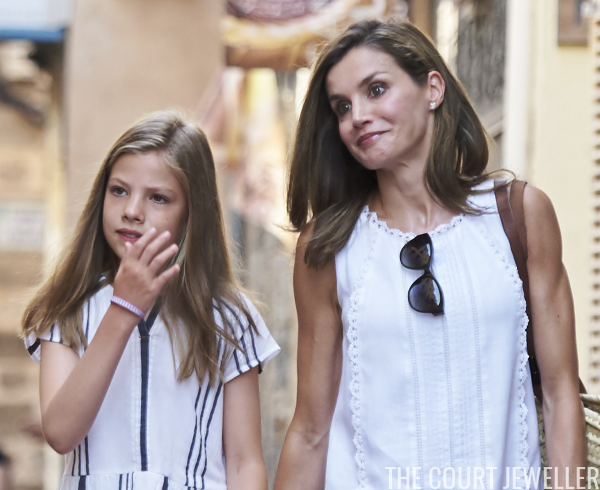 The royal family of Spain is in Palma de Mallorca for their annual summer holidays, and they've been wearing lots of summery jewelry out and about. The holiday began with the annual summer photocall in the gardens at Marivent Palace on July 31. Queen Letizia wore the starry Milky Way earrings from Gold and Roses. Here's a look at everyone's complete outfits -- don't you love how the photographer tried to accommodate the family's rather impressive height differences? Elena wore major layered jewels in vibrant hot pink, including long tassel earrings. 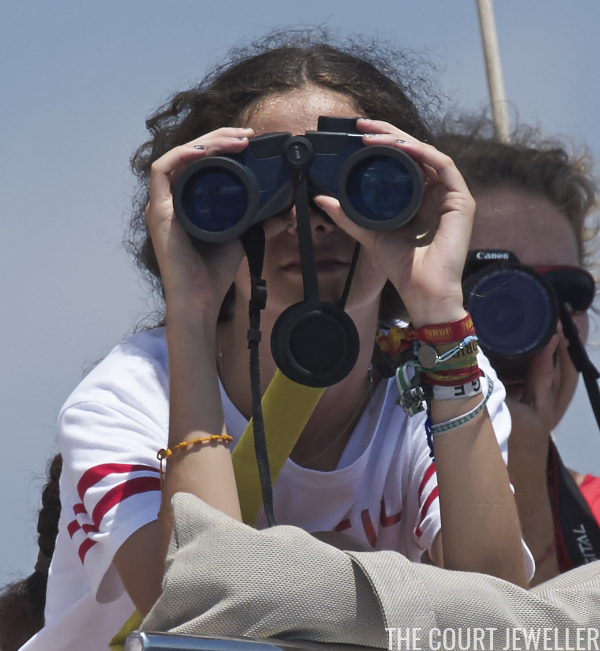 Friday saw members of the family head out to sea to watch the Copa Del Rey Mafre Sailing Cup. 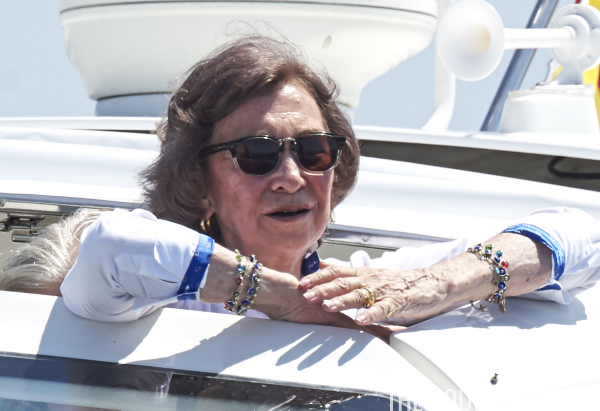 Queen Sofia wore stacks of bright bracelets on each arm, plus golden hoop earrings. 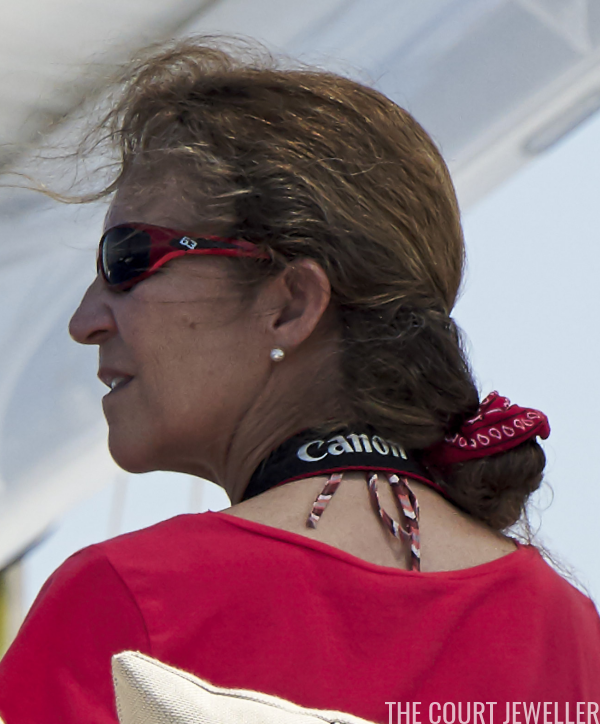 Infanta Elena toned down her jewelry for a day on the water, wearing simple pearl stud earrings. 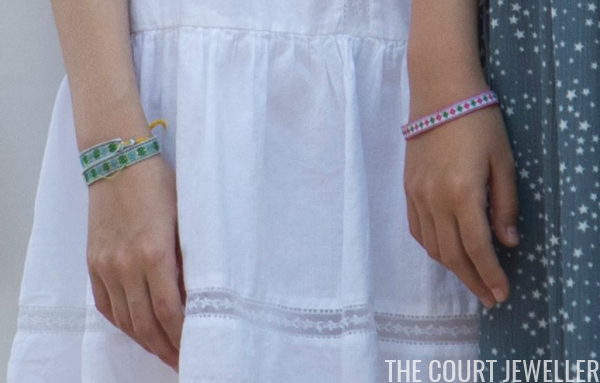 But her daughter, Victoria, has clearly picked up her mother and grandmother's fondness for a good arm party. 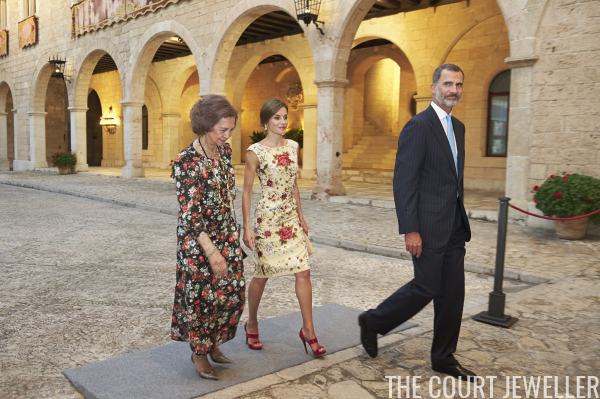 At Almudaina Palace on Friday evening, Queen Sofia joined King Felipe and Queen Letizia for a dinner with local dignitaries. Letizia accessorized her floral dress with a pair of new golden flower earrings: the Almond Flower Gold Earrings from Helena Nicolau. 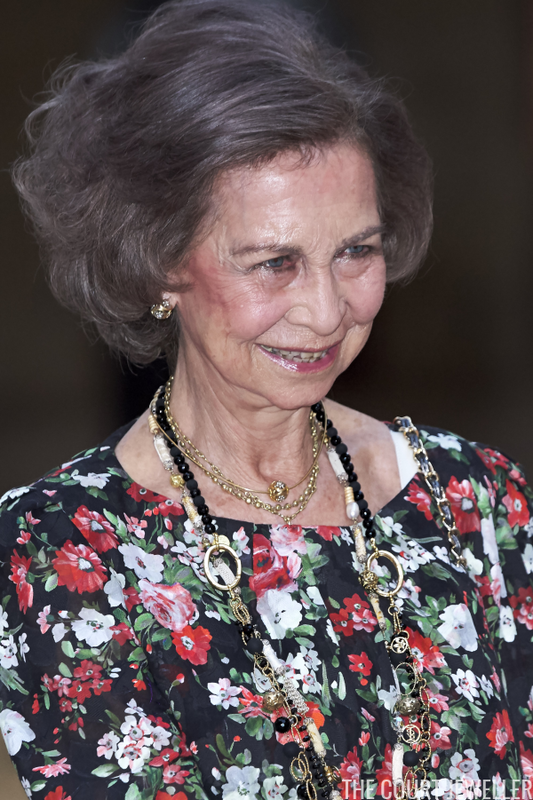 Queen Sofia went for her usual layered necklace look. One of the necklaces matched her earrings, which were made of gold with glittering accents. Here's a better look at both queens in their floral ensembles. Letizia's dress was reportedly made specifically for her using fabric from a traditional Manila shawl. 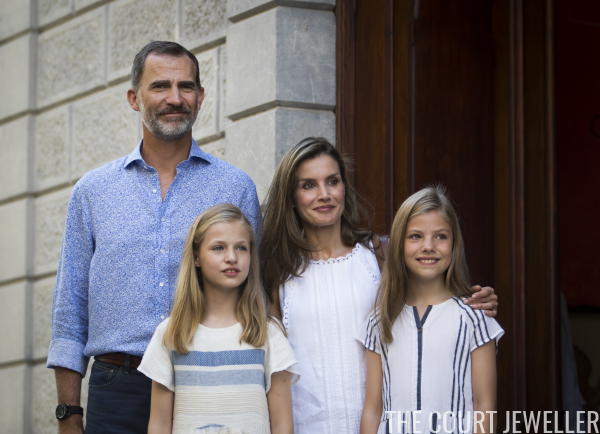 On Sunday, King Felipe and Queen Letizia were accompanied by their daughters for a visit to the Can Prunera Museum in the village of Soller. Letizia wore one of her favorite pairs of small stud earrings, the star-shaped Comete earrings from Chanel. 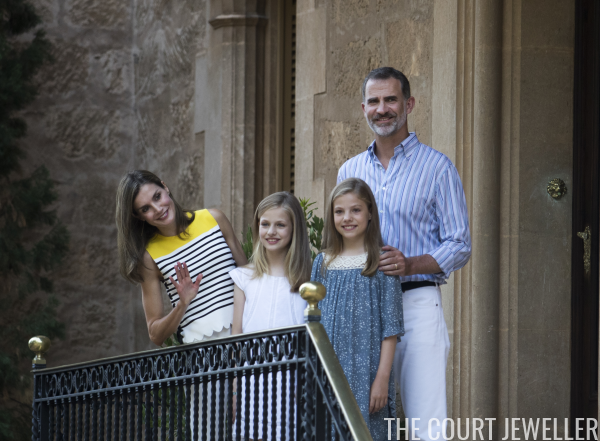 Princess Leonor followed along with the star theme for the day, wearing a familiar ornament in her hair. This star-studded headband, made by NANOS, has been worn by Letizia in the past (in fact, with the Chanel star earrings she wore on this particular day!). 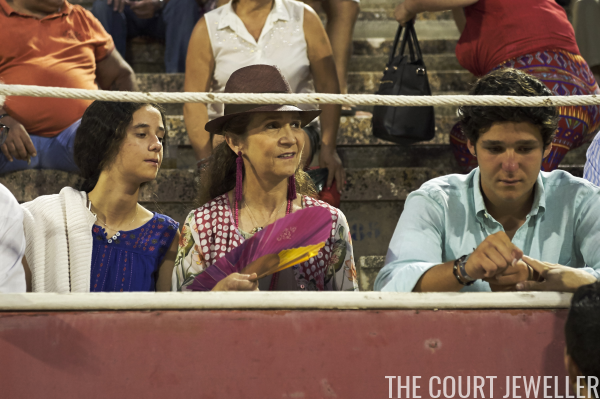 Infanta Sofia wore the same woven bracelet that she sported during the earlier family photocall. Here's a better look at Letizia's cool summer shift dress and rhinestone-encrusted sandals.